702 – kellion Timiou Stavrou: a mystery solved !! In my Photo archive I came across this picture of the “mysterious” Ukraine kellion, of which I wrote in blogs nr 187, 188 and 192, that I never showed here before. At that time I did not know the exact name of this place, but with the help of a Dutch and German reader this mystery was solved, but I forgot to post their reactions in English, so here it is. The leaflet that I found in the former library of the kellion was helpful, because our readers found out that the name of this Ukraine Kellion is (in Greek) “ Kellion Timiou Stavrou. The translation of the cyrillic text is: “Obitel Bosdrischenje Kresta Gospodija”, which means in German “Kloster der Erhaehung des kostbaren und lebenspendenden Kreuzes”, in English “The Kellion of the Exaltation of the Cross” . 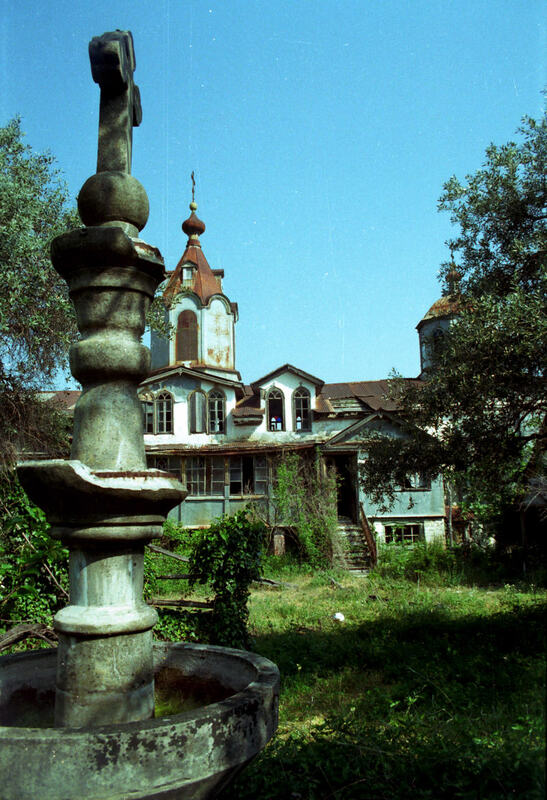 It is not related to the monastery Panteleimon, but one of the monks that lived there was named “Nastojatelju ieroschimonachou Panteleimonou s brati”, meaning “leader priestmonk Panteleimon and Brothers”. 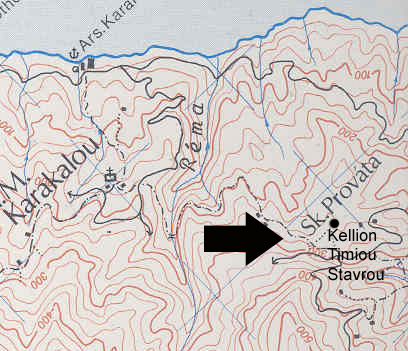 The Kellion lies in the area of Provata, but belongs to the monastery Karakalou. 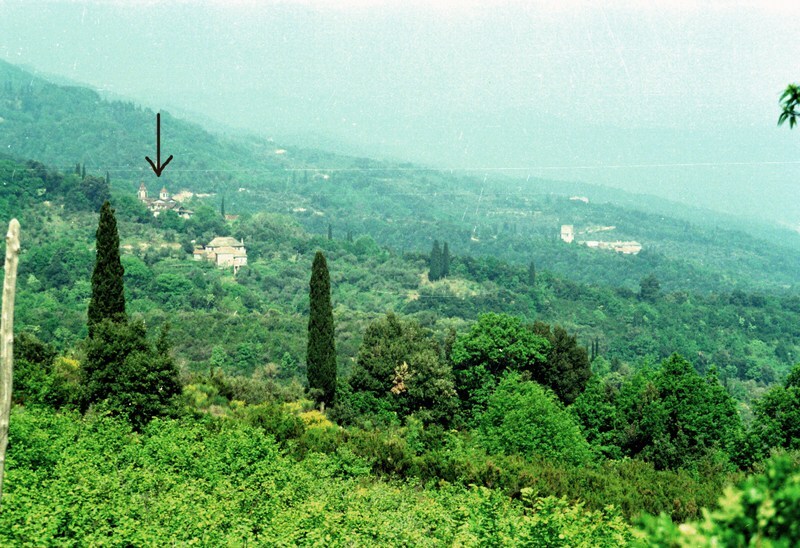 According to a Greek book the kellion can be exactly situated and found on the map of Reinhold Zwerger. It is the building lying next the letters “Sk.” of Sk. Provata. In the book of Fennel on page 195 the kellion is also mentioned as the “The Kellion of the Exaltation of the Cross, belonging to the Karakalou Monastery”. It is said that the kellion is connected with the existence of a very large bell, which I have seen hanging in the tower. Who raised money the build this very large kellion ? When was it build ? Did it give any problem, an Ukraine building amidst Greek en Rumanian property ? How many monks lived there ? Does someone has the answers..? By coincidence our fellow blogger Kelliotis reported about a similar building/Kellion Agiou Artemiou 5th of februari 2009 also belonging to Skiti Provata ! This entry was posted in Timiou Stavrou. Bookmark the permalink. 5 Responses to 702 – kellion Timiou Stavrou: a mystery solved !! I found your site by checking the “coming from”-links of my blogvisitors. I looked just for a while through the textes and the photos and it’s so much information here! It also makes me feel anxiety to visit Athos again! Keep on the good work. I am visiting you again soon to go through the hole site. Where are you from by the way? Are you greeks? Many thanks Georgios. You’ve have made some beautiful photo’s. Thank you for keeping this log because women are not allowed on the island, it was very interesting for me to see your photo diaries. I just wanted to comment that the “mysterious place” you were talking about is not Ukranian but Russian and the booklet you are showing is also in Russian but in Russian before the revolution (i.e. before 1917), so the letters look a little different from now days Russian. Thank you again for all the work you did, so people can enjoy and learn more about this island. I am not an expert and I don’t prefer a political discussion. But, if the monks came from Odessa, they are Ukrainian I think. That also fits with the text. 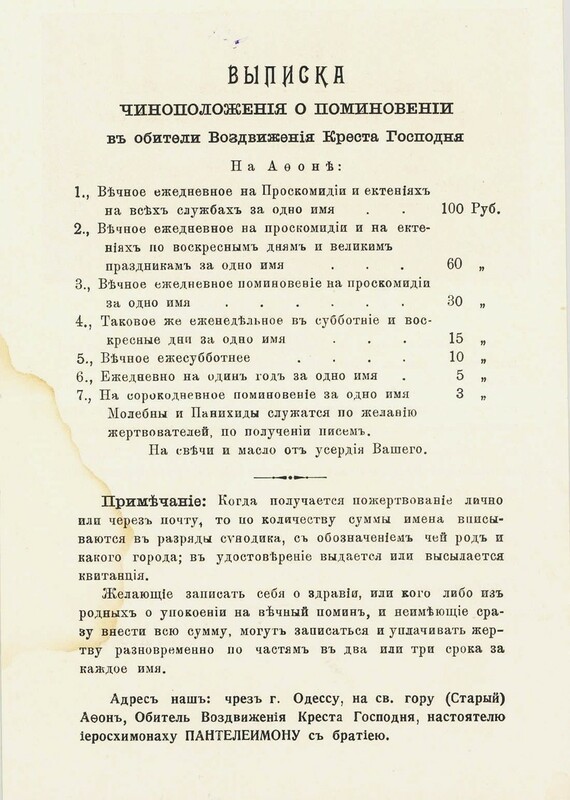 Because as far as I am informed the writing of the booklet is really Ukrainian and not Russian (before 1917). But Pentzikis speaks about ‘Russians in this area’. Thanks Irina for your input. These kinds of compliments (of a woman) gives us a reason to continue our blog! 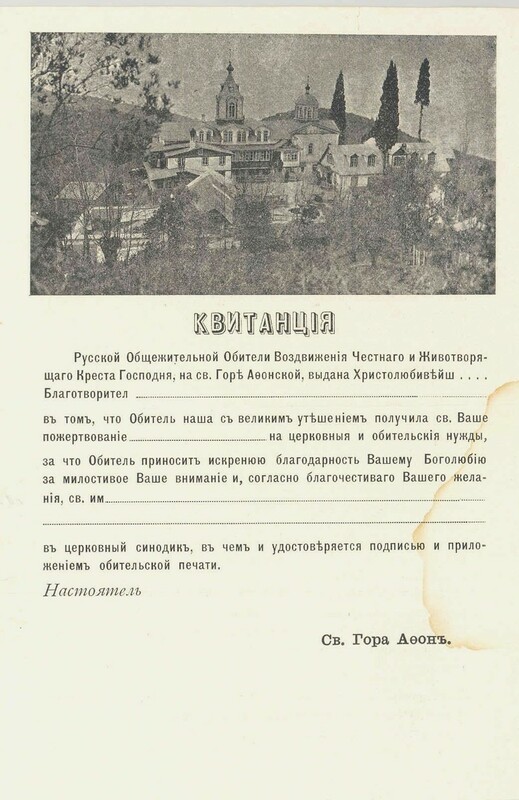 I do know that the monks started their journey to Mount Athos in Odessa (from there they went to Constantinople, then to Jeruzalem and finally to Mount Athos: I found there passports on the floor), but does the text of the booklet gives us any more indications about their nationality ?